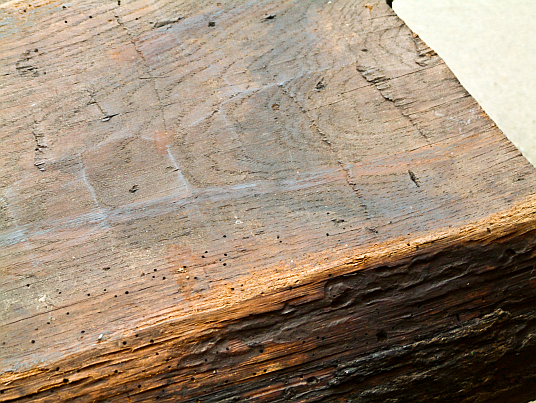 A dendrochronological dating of samples from a building provides us with the year the tree was cut but does not indicate the year the building was erected. Nevertheless, regularly there is a close connection between both dates, because at all times timber was used “green” only a short time after the tree was cut. There is ample evidence for this claim. 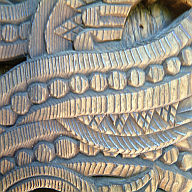 Tangential and radial shrinkage behaviour for instance, tendentially leaves a rhombic cross-section in solid wood after drying. Dry wood in contrast remains stable in cross-section. Another evidence is the presence of bark on timber implemented in a building-construction. This circumstance can only be explained with the utilization of green wood, for the bark would be infiltrated by insects and flake off even if the wood would be stored for just a short time. This also applies to the sapwood, which would be destroyed by insects in only a few years of storage. Thus the timber would be visually impaired in a way no principal could ever accept and a further surface treatment (e.g. profiling) would be impossible as well. Furthermore, it is quite obvious that carpenters tried to avoid every unnecessary obstacle within the processing of the construction parts. Sawing, working with axes and hatchets, drilling and chiselling can be done twice as fast using green wood instead of dried wood. Whole timber beams were not often used for construction purposes. For the production of half- and quarter-timbers the so called open pitsaw was used. Traces of the work with this special saw which can be found on construction timbers up to today witness its enormous propulsion through the wood. The propulsion of the saw from cut to cut can easily be 1cm or even more. But such a degree of propulsion could never be reached in a dried piece of wood. Working marks of axes and adzes can tell us about the condition of timber at the point of processing as well. A cut with an axe or an adze leaves quite a smooth surface on green wood, whereas on dried wood the surface would fibrillate and partly split off. Oak wood treated with a broad axe. The surface is very smooth and thus tells us that treatment took place whilst the wood was green. The clearest evidence for a treatment of wood directly after felling provide written sources. Thus the timespan between the year the tree was cut and the year the building was erected may easily be determined. Additional investigations on epigraphically or archival dated buildings revealed an accordance ratio of about 90 % and a maximum time difference of two years between felling and housebuilding (Ernst Hollstein). Even a time difference of up to three years, which Bedal (Konrad Bedal: "Fachwerk vor 1600 in Franken", p. 17) assumes, should be accepted by building researchers. However, even bigger differences have to be taken into account, especially in the case of softwood. In many regions water-stocking was carried out as a method of timber proofing. Oral lore tells us that water-stocking lasted for at least one but not more than two years. Nevertheless, it is inappropriate to derive any rule from that, because long lasting water-stocking (several years) is known from shipbuilding for instance and carried out up to today. If the timbers of an object under investigation are suspected to have been stored in water or to have been floated, evidence for that may be provided by an additional method of investigation. 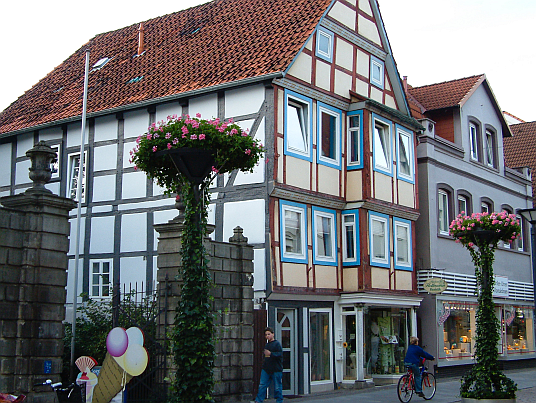 Two-storeyed half-timbered building in Rinteln, Klosterstraße 10. Dendrochronologically dated spring/summer 1692, epigraphically dated 1692. Referring to the shape of the last annual rings the point of time when the trees were cut for the erection of the building was May/June. In some cases the year of felling may be synchronized with the year the building was erected. Well known written sources about a house which was built in the Twente area (Netherlands) show for instance, that the trees for construction were cut in spring/summer 1618 carrying out instructions from a so called “Holting” in February 1618 to cut the trees in their growth phase. The house was erected in the same year. The basis for dendrochronological dating is the last remaining annual ring. This treering deliveres the only reliable date. Building researchers have to add the empirically established figure for the time between felling and housebuilding. In recent publications it has become common to publish the date the tree was cut and to mark this date with (d). Epigraphicaly dated objects are marked with (i) and objects dated by written sources are marked with (a).